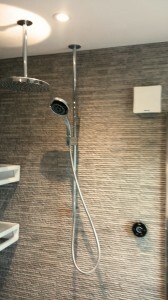 We fitted this Mira digital shower in a wetroom. I really like it. It looks amazing and the functionality is superb. 1. The bathroom was on the first floor and with an empty loft space above. We could install the pump and mixer unit and all of the plumbing in the loft above. The mixed water feeds come down through the ceiling from above. You don’t have to chase any pipework or electric cable into the walls behind the tiles. The control is wireless. 2. It is unusual for digital showers to have a fixed head and two separate outlets. This one does and not only that the handheld shower has four different functions you can use by turning the head. 3. It is really easy to install and set up. Once plumbed in you just switch on the control get it to register the pump and then just turn it on. It even runs for up to 15 mins completely dry without damage so if you do make a plumbing mistake initially you aren’t going to damage the pump due to your mistake. I will be recommending these showers in future. There is a version for high pressure systems as well. They are available for fitting into different locations if you aren’t lucky enought to have empty loft space above. There is a version for most situations. You will be able to install the digital wireless controls for showers and the mixer where they can be easily accessed in the bathroom. This is the future of mixer showers. The biggest problem with the traditional valves is that the plumbing and valve itself is buried in the wall behind the tiles so can be really difficult to access for maintenance.